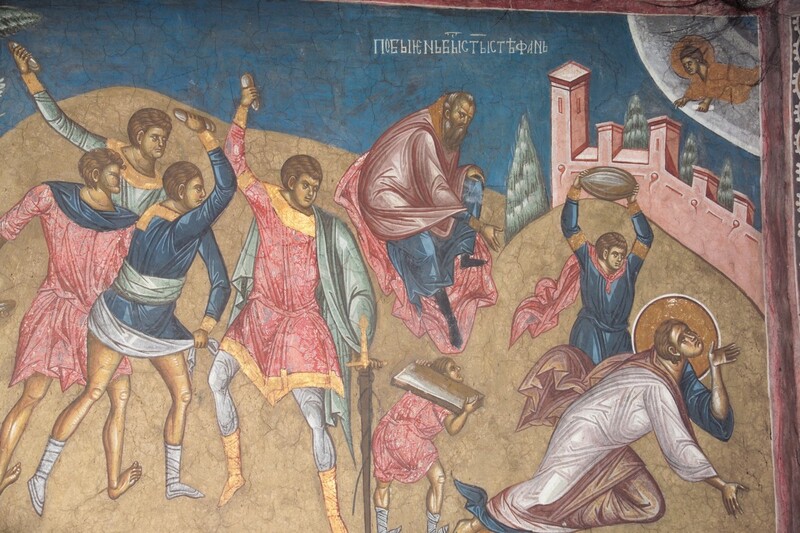 Today we celebrate a secondary feast of St. Stephen and we read about his martyrdom from the Book of Acts. The Book of Acts… the Acts of the Apostles. Note that it’s called the Book of Acts – not the Book of Truths or the Book of Dogmas. Πράξεις των Ἀποστόλων. The Greek word praxis is the root of our English word “practice” – not practice in the sense of a musician or sports team practicing, but in the sense of a law or medical practice: a professional practice with a mission statement. So praxis in its classical meaning implies informed, committed action on behalf of human well being and the search for truth. It is the action of people who are free, who are able to act for themselves. Therefore, praxis is always risky. These thoughts are relevant to the Book of Acts, because Luke, the author of this book, was an educated Greek and was very clearly well versed in rhetoric and classical Greek ideas about knowledge and education. Stephen is the perfect example of informed, committed action and the risk that comes with it. If he were just another talking buffoon like the ones we see on TV talk shows and cable news, no one would have paid much attention to him. But he spoke with knowledge and insight – especially knowledge and understanding of history. He reminded his listeners of their past history and past failures. That was guaranteed to bring a death sentence upon him. Nations and groups of people like glorified, sanitized versions of their history, not the full, often ugly, truths. The Jews of that time were no different than the Greeks or Americans of today. It’s human nature; it’s the law of society. Go against it, and you risk everything. That’s the risk of praxis. That was the risk Stephen took. 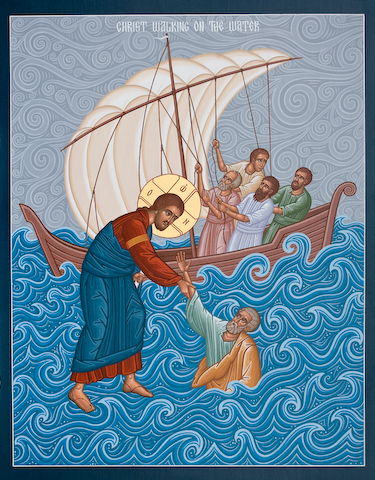 We see another form of praxis at work in our Gospel reading today: The disciples’ boat is tortured, βασανιζόμενον, and Jesus walks on the water to them. They are terrified, εταράχθησαν; they think it’s a ghost! The storm is not only external; it is raging inside them as well. The struggle to be a disciple is part of praxis – the act of following Jesus. But note Jesus’ words: θαρσείτε, εγώ ειμί. Those beautiful words, εγώ ειμί, it is I, I AM. Those same words are spoken to every disciple, every follower of Jesus, in the moment of crisis and doubt. ThIs became the name of God in the Hebrew Bible, what we call the Old Testament. 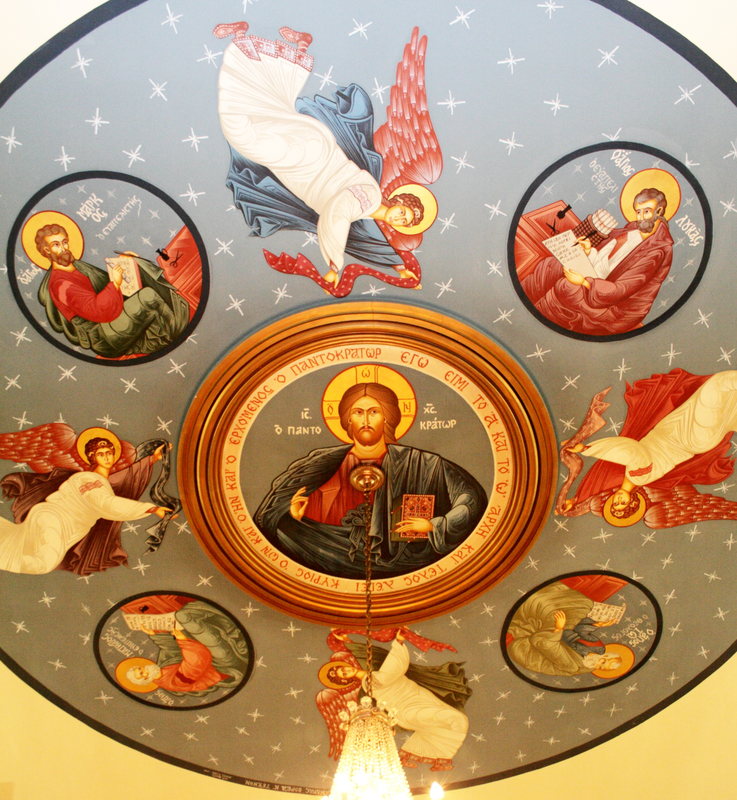 And they are the words with which Jesus comforted or challenged people around him, as in John 8:58 – Jesus said to them, “Truly, truly, I say to you, before Abraham was, I AM.” They are also the words inscribed in our ceiling icon! Buddhists speak of their practice; they don’t speak of Buddhist beliefs, they speak of Buddhist practice. The Book of Acts is not the Book of Beliefs, but the Book of Praxis. In this book we see the practice of discipleship in the early church. And we learn about our Christian practice, our praxis. The praxis of every disciple of Jesus Christ is to follow the one who says I AM. Categories: Sermons | Tags: Book of Acts, discipleship, I AM, Jesus walks on water, martyrdom of St. Stephen, name of God | Permalink. This is good, Kostas, especially the comments on the walking on the water and the I am. I’ve had some bad times in my boat, so I can identify with the disciples, and their vision of Jesus. Of course it IS a visionary story rather than a historical one. So we have to be ready to hear the I AM when he speaks. That word may come to us from our own thinking but sometimes it comes from outside. There’s a marvellous story by Raymond Carver, called A Small Good Thing, which I’ll send you, that includes an unexpected I AM moment.